It Is -Required- That You See Psycho From The Very Beginning! Fourteen of the finest works from the universally acclaimed Master of Suspense come together for the first time in one collection. These captivating landmark films boast three decades of Hollywood legends, including James Stewart, Grace Kelly, Anthony Perkins, Sean Connery and Doris Day. 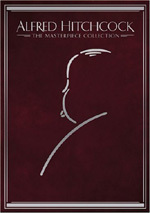 The premium packaging and collectible book make Alfred Hitchcock: The Masterpiece Collection the must-own, definitive anthology of gripping works by a true genius. Alfred Hitchcock's landmark masterpiece of the macabre stars Anthony Perkins as the troubled Norman Bates, whose old dark house and adjoining motel are not the place to spend a quiet evening. No one knows that better than Marion Crane (Janet Leigh), the ill-fated traveler whose journey ends in the notorious "shower scene." As first a private detective (Martin Balsam), then Marion's sister (Vera Miles) and boyfriend (John Gavin) search for her, the horror and the suspense mount to a terrifying climax where the mysterious killer is finally revealed. • "The Making of Psycho"
Filmmakers these days - they're not stupid! I mean, they're some sharp cookies who really know what they're doing. They know that there are just some things with which you should not mess. Take film remakes, for example. Sure, we might see new versions of forgettables like The Out-of-Towners or movies based on TV shows, but there's no way directors would ever touch any of the classics. Gone With the Wind, Casablanca, Psycho - those movies were all perfect the first time! You'd have to be bonkers to tamper with any of those. Not gonna happen! Well, Van Sant's bizarre little experiment in uncreative filmmaking aside, directors usually know better than to push their luck in such a way. Actually, the remake of Psycho did nothing more than reaffirm what a classic Hitchcock's original was. More than 40 years later, it still stands up as a terrific piece of filmmaking. Often it's hard to see why older films like Psycho made such an impact, especially when they come from such an overdone genre as the slasher flick. Psycho has been liberally stolen from over the years, and it'd be easy for it to lose its impact compared to the more graphic films that have come since 1960. Happily, such is not the case. I won't say that Psycho hits the viewer the way that it did when it first was released, because society has changed too much; what was once intensely shocking now can be shown on broadcast TV at three in the afternoon. Nonetheless, Psycho remains a pretty intense and powerful little film. Although it doesn't work the same way it did in 1960, that doesn't mean that it's devoid of impact. Actually, the film continues to pack a nice little punch. While it doesn't seem shocking, it remains creepy and scary enough to maintain interest. Much of this is the result of Anthony Perkins' fantastic performance as Norman Bates. Why he didn't receive an Academy Award nomination is beyond me because he offers the performance of a lifetime here. Perkins really brings out the nuances in Norman and keeps him from seeming like a stereotypical nut for much of the time. When we first meet him, he seems boyishly charming and somewhat socially inept, but not terribly creepy. We don't question why Marion Crane (Janet Leigh) would let herself get into a position of being alone with this stranger. It's only slowly that Norman's dark side emerges, and Perkins makes these transitions - and the corrections back to normalcy that he has – progress smoothly and effortlessly. As much as Hitchcock's skill led to the success of the film, I think Perkins' amazing performance is the main reason the film still works. He so thoroughly inhabits the role that it's no wonder he ended up trapped by it in the future. Leigh is also quite good. She displays a splendidly cool aura about herself; she seems very distant and distracted and doesn't want to let anyone get too close, which is appropriate for her character. It must have been terrific fun to see this film back without knowing much about it. The film has so many plot twists that it must have been quite startling and entertaining; after all, the movie starts down one path and abruptly detours about a third of the way through. I thought that most of rest of cast offered fairly flat performances, but that's not necessarily a bad thing. Their lack of pizzazz helps make Norman's unusual qualities stand out more and this helps make him seem stranger without having to resort to stereotypical lunatic behavior. John Gavin and Vera Miles are rather uncompelling as Marion's lover and sister, respectively. I don't mind that, partially for the reasons I already mentioned, but also because they exist mainly as plot devices. They're the carrots that bring the story around and they aren't meant to offer much to us as characters in their own right. Although his role is also largely expository, Martin Balsam does a nice job as private detective Arbogast; he adds a little spice to his interactions with Dull and Duller Gavin and Miles. Psycho is a hard film to review because it's fame makes it virtually critic-proof. Thankfully, I don't have to attempt to pick it apart because I really like it - almost surprisingly so, because I sometimes find that "classics" don't quite live up to their enormous hype. While it clearly lacks the tremendous impact it boasted more than 40 years ago, Psycho remains an enduring and fascinating tale of someone who just goes a little mad sometimes. 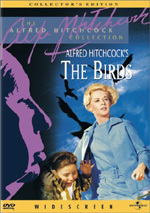 It remains arguably Hitchcock’s best film. Psycho appears in an aspect ratio of approximately 1.85:1 on this single-sided, double-layered DVD; the image has been enhanced for 16X9 televisions. That was a change from the old non-anamorphic disc. Although this version was a little stronger than its predecessor, it failed to demonstrate much improvement. Sharpness remained good but unexceptional. Actually, the anamorphic transfer tightened up matters a bit, as I saw less softness this time. The movie usually offered reasonably distinctive and detailed images, though some looseness occasionally interfered. I noticed no issues with jagged edges or shimmering, but light edge enhancement periodically interfered with the presentation. Source defects continued to be a concern. As with its predecessor, I saw marks, abnormally prominent grain, grit and white spots. They varied in intensity but caused more problems than I’d like. Black levels were generally pretty solid. At times they could seem a little inky, but usually they presented reasonable depth and dimensionality along with decent contrast. Shadows were also fine except for the usual “day for night” scenes; those came across as too dark. Other low-light shots could be a little thick, but not badly so. Overall, this was a watchable movie but not one that impressed me visually. Psycho featured a perfectly adequate monaural sound mix. It seemed typical of efforts from the era. The audio was somewhat dull and lacked detail, but I found it to also be clear and easily comprehensible. Music lacked much punch, as dynamic range appeared limited. Speech was a little reedy but seemed intelligible and without edginess. I was pleased to note that no substantial distortion occurred during the track. The soundtrack lacked spark and life, but it's acceptable based on the age of the movie. When we head to the extras, the main attraction comes from an excellent 94-minute documentary simply called The Making of Psycho. This program is created mainly from a combination of modern interviews interspersed with production photos and clips from the movie itself. We hear from actor Janet Leigh, writer Joseph Stefano, assistant director Hilton Green, wardrobe person Rita Riggs, Hitchcock's daughter Pat and his assistant Peggy Robertson. Although he didn't work on Psycho, editor Paul Hirsch also appears; he relates some anecdotes about his experiences working with composer Herrmann and also tosses in an interesting story that relates to his experience on Star Wars. In addition, filmmaker Clive Barker tosses out a few thoughts. Although this method has some limits due to the deaths of many of the film's creators - most notably Hitchcock and Anthony Perkins - it works very well and offers a nicely complete picture of the creation of the film. Despite the absence of so many main figures, I can't imagine that the piece would offer any more complete a picture of how the film was made. We start with issues connected to the adaptation of the original novel and then go through script development, casting, the shoot, post-production and the flick’s reception. All of these areas receive a lot of attention, and we learn a ton of great details. It's an absolutely terrific program that entertains as it informs. Speaking of terrific, the Psycho DVD also includes Hitchcock's fabulous trailer. This is one of the most unusual trailers I've ever seen; actually, it probably is the most unique promo reel I've witnessed. The trailer clocks in at more than six and a half minutes in length and it shows literally no clips from movie itself. Instead, it shows Hitchcock's droll little walk through the set as he discusses all of the terrible events that "happened" there. It's tremendously amusing and entertaining and is unquestionably one of the greatest trailers ever made. In addition to that little masterpiece, the DVD includes five re-release trailers. All of these are very similar; essentially they just promote the fact that the television version of Psycho is edited so you'd better see it in the theaters or else you'll miss some of it. These clips are interesting, but not in a league with the original trailer. The DVD features what it refers to as newsreel footage of the film's release, but that's not really accurate. Instead, it appears to be a promotional piece assembled to send to prospective exhibitors. The film originally opened only in the biggest markets first and then spread out across the country from there. As noted in this program, Hitchcock insisted on a very unusual exhibition practice whereby no one would be admitted to the film after it had begun. This film shows how that method worked and demonstrates the way things went at a New York cinema for these possibly jittery theater owners. I liked this piece quite a lot, for although it's somewhat redundant - many of the same points are repeated over and over again, kind of like in one of my reviews - it's a fun little look back in time. It runs for about seven minutes and forty-five seconds and it's well worth a watch. Psycho contains a very extensive supplement of still photographs. In all we see about 200 pictures, but they're rather confusingly organized. The "lobby cards" and "posters and Psycho ads" chapters are exactly what they say they are; we see eight lobby cards and about 13 posters/ads in these areas. However, the 101 "production photos" shown in that section are actually promotional shots; some of these are taken on the sets, some aren't, but all are clearly staged for the photographer and intended to promote the film. We also have 44 photos in the “Psycho Archives” and 48 pictures in the "Behind the Scenes" area. These are all actual production photos of the cast and crew working on the set, and they probably should have been all placed under one heading. Anyway, I most enjoyed the "production photos;" I found the staged promotional shots to be very interesting and entertaining. Real production photos don't do a lot for me, but the ones shown here are pretty good. One final "visual" heading depicts the storyboards created by Saul Bass for the shower scene. I don't much care for storyboards, but I thought it was somewhat interesting to compare how the scene was conceived opposed to how it was executed. Universal should have run the film alongside the storyboards in a split-screen configuration, though, so we could more directly make that comparison. Finally, the DVD contains some pretty good production notes. These aren't a replacement for the terrific documentary, but they do supplement it well. For the most part, these extras duplicate those found on the original DVD. Oddly, they drop some cast and crew biographies. I have no idea why those got the boot; I can’t say I miss them, but I don’t understand why they’d go missing here. Recommendation time, and this one's easy: Psycho is a must-have in any film buff's DVD library. The movie itself still earns its status as a classic, largely due to Anthony Perkins' enduringly amazing performance as Norman Bates. The picture and sound quality of the DVD are mediocre, but we get a very nice set of extras. Psycho earns my recommendation. However, it seems likely this release will disappoint fans who already own the prior DVD. This one tightens up its predecessor’s picture by a little, but it doesn’t come across as substantially improved in that department. Sound and extras remain the same. Psycho still needs some work to give it the presentation it deserves. 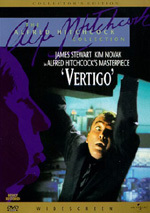 Note that this version of Psycho appears only as part of the 15-DVD Alfred Hitchcock: The Masterpiece Collection. This massive release also includes Saboteur, Shadow of a Doubt, Rope, Rear Window, The Trouble With Harry, The Man Who Knew Too Much, Vertigo, The Birds, Torn Curtain, Marnie, Topaz, Frenzy, Family Plot, and a disc of bonus materials. As of October 2005, when or if a solo version of this DVD will come out is currently unknown.